On 27th of August, an international spiritual gathering of Layla-tul-Qadr was held in the Itikaf City of Minhaj-ul-Quran International. Shaykh-ul-Islam Dr Muhammad Tahir-ul-Qadri delivered a special address and led a tearful Dua. In addition to thousands of the Mutakifeen, millions of people traveled from all parts of the country to take part in the annual mega event of Minhaj-ul-Quran International. The complete proceedings of the program were telecast live around the world through www.minhaj.tv and ARY-QTV, while the special prayer of that night was telecast live by Geo TV, City 42, Dunya TV, Sama TV and other TV channels. A large number of religious scholars and Amir-e-Tehreek Faiz-ur-Rehman Durrani, Sajjada Nasheen Astana Alia Bhaira Sharif Sahibzada Pir Amin-ul-Hasnat Shah, Secretary General Dr Raheeq Ahmad Abbasi, Sheikh Zahid Fayyaz and others attended the program. Huge digital screens were installed both inside as well as outside the venue. The formal proceedings of the program got underway with the recitation from the Holy Quran by Qari Allah Baksh Naqshbandi followed by Naat Khawani in which Muhammad Afzal Noshahi, Minhaj Naat Council, Zaheer Bilali Brothers, Amjad Bilali brothers, Anser Ali Qadri, Shahzad Brothers and other renowned Naat Khawan took part and had the honour of presenting Naat. Allama Ghulam Murtaza Alvi gave a brief introduction of the newly published books of Shaykh-ul-Islam Dr Muhammad Tahir-ul-Qadri. 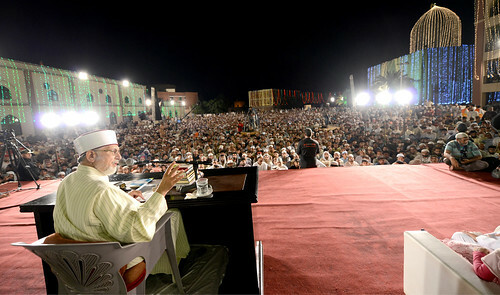 He told the audience that the number of published works of Shaykh-ul-Islam Dr Muhammad Tahir-ul-Qadri has reached 415. The participants of the spiritual gathering offered ‘Tasbih’ prayers at 11 p.m.
Sahibzada Allama Zaheer Ahmad Naqshbandi presented introduction of the welfare activities of Minhaj Welfare Foundation and particularly threw light on ‘Aaghosh’ project of MWF. Dr Raheeq Ahmad Abbasi, Secretary General of Minhaj-ul-Quran International, presented a welcome address on the occasion. He said that the people have not come to perform ritual of Itikaf here, rather the Itikaf has been held for the progress and security of Pakistan in which people have taken part to seek forgiveness of their sins and pray for peace and security of Pakistan. He said that the holding of Itikaf City in an age marked by violence and mischief signifies a strong hope for which Shaykh-ul-Islam Dr Muhammad Tahir-ul-Qadri is spreading the message of peace and harmony around the world. He said that Shaykh-ul-Islam’s special addresses on the occasion are a source of spreading public awareness and inspiration to the Muslims to expose the so-called terrorists from their ranks. He said that Shaykh-ul-Islam has told the world in crystal clear terms that Islam is not a religion of terrorism, extremism and narrow-mindedness, but is a religion of peace, harmony and human dignity. Dr Raheeq Ahmad Abbasi said that 30-year old struggle of MQI is epoch-making, which we have to work hard to make more historic. He said that we would have to make a resolve that wherever we go, we would convey the Islamic message of peace, welfare and happiness in the world. In his speech to the participants of the spiritual gathering, Sahibzada Pir Amin-ul-Hasnaat Shah, Sajjada Nasheen of Aastana Alia Bhara Sharif, said that Itikaf City is that place where dirt on the hearts is being removed. He said that Layla-tul-Qadr was the night on which the Holy Quran was revealed. He said that it is a result of this sacred night that countless blessings are being showered and the participants are enriching themselves with it. He asked the people to submit themselves to Allah Almighty and plead for His mercy and forgiveness. He said that he was full of prayers for MQI and its mission of peace and interfaith dialogue. Muhammad Afzal Noshahi presented Naat before Shaykh-ul-Islam Dr Muhammad Tahir-ul-Qadri delivered his address. In his special address to the millions of participants of the international spiritual gathering, Shaykh-ul-Islam Dr Muhammad Tahir-ul-Qadri spoke on “excellence of morality”. He said that all Sufis have their consensus on the definition of spiritualism that it is all about gathering eight basic characteristics. He who succeeds in inculcating these characteristics in him becomes a Sufi in the true sense of the word. These eight characteristics are munificence and generosity of self like Hadrat Ibrahim, remaining pleased with Allah like Hadrat Ismael, patience like Hadrat Ayyub expression through body language keeping reticent like Hadrat Zakariyya, indifference to the world like Hadrat Yahya, piety, tourism of Hadrat Isa, and woolen cloak of Hadrat Musa representing Faqr. Shaykh-ul-Islam said that benevolence is the first condition of spiritualism. That is why no miserly or close-fisted person can become a Sufi. The best example of benevolence was presented by Sayyidna Hazrat Ibrahim (AS) when he rendered the supreme sacrifice of his son. He never gave the impression as to why Allah asked for sacrifice of his son. Allah Almighty put Hadrat Ibrahim in the second test when he was thrown in the fire by Namrud. He was also tested with regard to benevolence of his belongings or possessions. He said that the second prerequisite is to be pleased with Allah Almighty in every case. The sacrifice of life presented by Hazrat Ismail (R.A) represents the best example of being pleased with Allah. He asked his father to slaughter him and if Allah willed, he would find him among the patient. This was the state of being absorbed in pleasure of Allah. Shaykh-ul-Islam Dr Muhammad Tahir-ul-Qadri said that the fire of jealousy, strife, worldly greed, bias, and enmity is raging today. Spiritualism means to break the shackles of greed and avarice and become free. The Sufis start their journey on the path of gnosis from this point. He said that in early times when people had raging desire for spiritualism and strove hard to become its followers, there was more a manifestation of its essence than its form. Today, spiritualism has become devoid of essence and is all about form and presentation. Dr Muhammad Tahir-ul-Qadri said that we have touched the pinnacle of oppression whereby the competent have been rendered incompetent and vice versa. This explains why we are exposed to severe conditions. The ruling elite is ready to everything for the sake of power. Shaykh-ul-Islam Dr Muhammad Tahir-ul-Qadri said that the world has become our ultimate destination and we have practically broken our relationship with our Lord. The majority of people are so overwhelmed by the materialistic desires that acquirement of the worldly interests has become our topmost priority. He said that this materialist attitude is gnawing our faith and our mental and physical capabilities are being used for the attainment of luxuries only. He said injustice is keeping things out of place. And most unfortunate is the fact that the nation has committed this injustice by making the incompetent lot their leaders and the corrupt, rogue and the misguided elements have been put in the saddle. “Usurping the right of others and violating the honour of the people has become the habit of the ruling elite. It is regrettable that those who were to safeguard life, dignity and honour of the state and society have ended up becoming plunderers of the worst kind. Terrorism is holding sway in the country and slitting the throats of one another has become a routine,” he added. Dr Muhammad Tahir-ul-Qadri said that our hearts have become devoid of fear of Allah and the culture of loot and plunder has become rampant. He said that people become miserly while spending for the sake of people’s welfare and open up coffers of their wealth for the satisfaction of their base worldly desires. Violating the self-respect of the underprivileged and downtrodden sections of society has become a norm in society today and facade of helping the poor is often resorted in order to achieve social prominence. The situation, he added, has come to such a point that attitudes marked by conceit, jealousy, bias, enmity, and oppression have become worthy of pride, while the followers of spiritualism would regard them as manif violation of what Islam stands for. Commenting on the state of spiritualism in society, Dr Muhammad Tahir-ul-Qadri said that spiritualism has been confined to performance of rituals, whereas the fact remains that it is all about excellence of morality, character and manners. He said that spiritualism relates to how excellent one is in one’s interactions and dealings with his fellow human beings. “If one is able to be excellent in his attitude towards people, Allah Almighty enables such a person to worship Him as well. If a spiritual person is informed of productive knowledge, his view on life undergoes a drastic change,” he maintained. Dr Muhammad Tahir-ul-Qadri maintained that today’s concept of spiritualism is devoid of action while it is all proactive. Spiritualism, he said, means sacrificing one’s own rights and struggling to restore others’ rights. “Spiritualism advocates the inculcation of attitude of patience, self-control, hard work, bravery, and justice and frees its followers of the hold of ignorance, oppression and lust,” he held. Dr Tahir-ul-Qadri said that there is a need to launch a struggle against ignorance and illiteracy, which in other words, requires the attainment of productive knowledge. He said categorically that we have no future without knowledge. Urging the need for self-accountability, he said that positive values can take root in the society only if we work towards eliminating negative attitudes like arrogance, jealousy, enmity, revenge and pursuit of lusts. Spiritualism is all excellent morality, proprieties and social interactions. It is righteous character. After the conclusion of his speech, Shaykh-ul-Islam led a tearful Dua for security and peace in the motherland, its progress and prosperity and reform in our individual and collective attitudes, conduct and behaviour. Millions of people beseechingly implored Allah Almighty to take mercy on them and steer the nation of the present crises. The special address of Shaykh-ul-Islam Dr Muhammad Tahir-ul-Qadri was broadcast live around the world through Minhaj.tv and various private TV channels including Geo, ARY, City 42, Samat TV and Dunya TV networks.